Sint-Catharinakerk te Eindhoven [with plan] - HODGKIN, W.E. Title : Sint-Catharinakerk te Eindhoven [with plan]. Map maker : HODGKIN, W.E.. Size : 6.3 x 10.2 inches. / 16.0 x 26.0 cm. 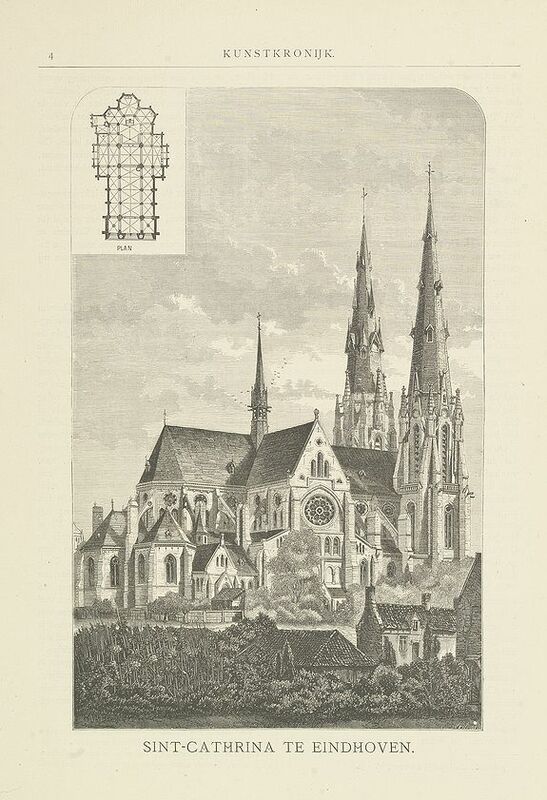 Description :Uncommon print of St.Catharina church in Eindhoven, built by the well-known architect P.Cuijpers. Published in Kunstkronijk. This wood engraving is similar to the one published in the"Katholieke Illustratie" of 1875, but has in the upper left corner an inset of the plan of the church. Signed lower right by the engraver W.E.Hodgkin and to the left H.W.Brewer was a well-known illustrator who also worked for the London Illustrated News. Condition : Wood engraving with letter press in Dutch.